In the last post, I covered the basics of preschool parenting, but many parents of little ones want to know what academic materials they should use with their children. What program will best prepare children for academic success? After years of teaching my own children and observing many other little ones (as a librarian, as well as a mother and teacher), this is what I have learned about the very best way to prepare children for a lifetime of exploring and learning. These principles are not expensive and they require almost no curriculum; what they mostly require is your time and attention. Anyone can do them, and they really are the best preparation I know for success in academics and in life. Talk with your child. The main way your child learns about anything that he isn’t actually putting in his mouth and experiencing first-hand is by hearing it from you. Family talk is how a child learns to speak, and then a large part of how he learns about the world. He wants you to talk a lot! You know that thing small children do, where they ask, “Why?” all the time, and eventually you find yourself trying to explain the structure of the atom? It’s not that he has a real understanding of cause and effect and how atoms work; it’s that he’s figured out that asking “why” is a really easy way to keep you talking. So all you really have to do is keep talking and explaining the world — you don’t actually have to try to explain “why” until you get to the Big Bang. As you go through your day, keep up a running commentary on what you are doing and why you are doing it. (Of course, this doesn’t mean you should never be quiet! Moderation in all things.) It sounds like this: “Let’s get in the car and go to the grocery store! We need some food…let’s get some oranges, I like oranges, don’t you? Should we get some apples too? What nice green apples these are. I need to get more oatmeal…” It certainly doesn’t have to be talk that your child can always understand; she will be happy if you aim a bit higher a good part of the time. All this talk deposits a tremendous amount of vocabulary and sentence structure and meaning in your child’s mind, not to mention that it fosters closeness between you. We are now finding out that one of the main things that prepares a child for school is this parental talk; a child whose parents aren’t in the habit of talking like this comes to school at a disadvantage that no amount of preschool or programming can make up for. Nursery rhymes are an integral part of this language development. They are wonderful little nuggets of language suited to the youngest children. They are games, songs, snuggle time, and language lessons all rolled into fun little packages. Learn nursery rhymes and use them often. My Very First Mother Goose, by Iona Opie and illustrated by Rosemary Wells (lovely for a first book of nursery rhymes, great pictures and not overwhelming). The Real Mother Goose, by Blanche Fisher Wright (old-fashioned, with lots of material). Make up your own rhymes, too! When my oldest daughter was an infant, we visited friends who had a baby about a year older. I remember how impressed I was with the mother’s ability to make up suitable little rhymes for whatever her daughter was doing. She didn’t do it all the time or anything, but every so often, a new little rhyme would come out of her mouth! Pretty soon I was doing it too, because it really turned out to be pretty easy. Reading aloud. Like the talking and nursery rhyming, reading aloud deposits a lot of vocabulary, sentence structure, and meaning into your child’s mind, and fosters a close, loving relationship. Reading aloud, however, is a step up in complexity. Once you are past the board books with one word per picture, books offer more complex words and sentences than ordinary conversation usually involves. They often feature rhymes, rhythm, and other language structures that both appeal to your child and build pathways for learning. She learns to associate books and reading with happiness and love. She learns that books and sentences go in a particular direction, and what sentences are supposed to look like. Reading aloud teaches a child about imaginative play, offering fuel for the stories she makes up herself. Books teach about the wider world; animals, machines, space, and whatever else you find. And for a final bonus, reading aloud gives you a habitual special time to be together with your child. 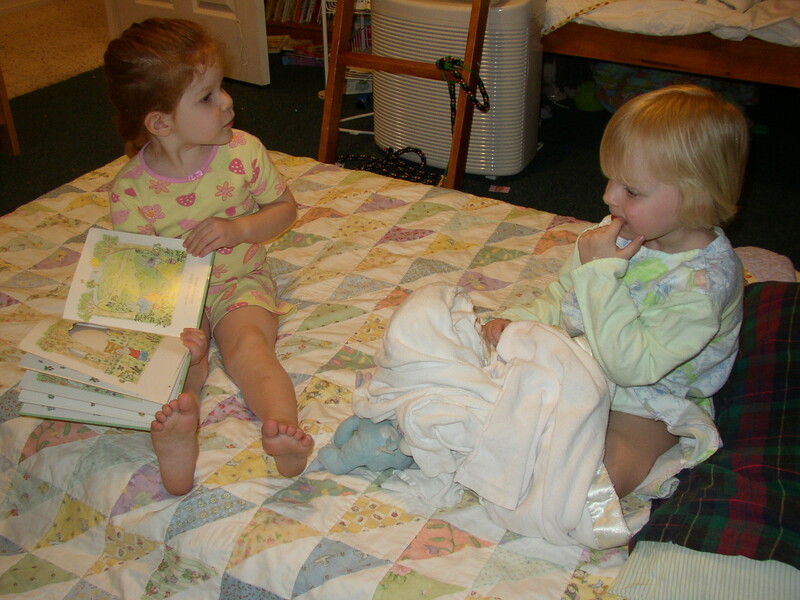 The value of all of this language and structure and snuggling is almost impossible to exaggerate; the child’s mind soaks up stories and general information, making connections and learning about the world, in a process that cannot be replaced by any preschool or institutional program, and certainly not by any video programming. Librarians and child development experts recommend that parents read to children for at least 20 minutes a day, which is an easy goal to reach most days (even if half of it is bedtime stories!). You may have seen in the recent news that doctors are now officially recommending that parents read to their children from infancy. Rosemary Wells even wrote a little pamphlet a few years ago called Read To Your Bunny to remind us of the benefits of reading aloud. And your local library almost certainly has a storytime program that incorporates these principles. Children love storytime at the library, so give yours a try! It actually turns out that reading aloud to your child is beneficial for more years than most of us expect. We now know that most children comprehend more through listening than they do through reading — right up through 8th grade! So don’t stop reading aloud once your child can read on his own; you can enjoy it for a long time. There are so many wonderful books to read aloud to your bunny that it’s hard for me to give you a good list. Here are a few classic titles, and my best advice is to ask your friendly neighborhood public librarian for recommendations; that is truly your best resource! The Nutshell Library, by Maurice Sendak — Four tiny books with wonderful rhymes about numbers, letters, the months of the year, and the perils of not caring. Millions of Cats, by Wanda Gág — A man and woman want a cat to keep them company, but the man can’t choose just one. What to do with the millions of cats he brings home? A Color of His Own, by Leo Leonni — Leonni has written many great picture books, but this has always been my favorite. A chameleon gets tired of changing all the time and wants to stay just one color. The Tale of Peter Rabbit, by Beatrix Potter — All the Potter tales are wonderful. (And I am particularly fond of the Tale of the Flopsy Bunnies. )Make sure you get the real thing, not the abridgments or new versions or celebrity sequels or whatever. She doesn’t need changing. While it may be tempting to save money by getting a one-volume collection, that really does ruin the child’s experience of having a little book that is just the right size, so I’d advise that you get a couple and supplement with the library if your budget doesn’t run to buying many books. Curious George, by H. A. Rey — Here again we run into the problem of so many new versions, sequels, and so on that the original Rey stories are almost crowded out. Be sure to get the few original books and beware of the ones based on the TV show. They are nowhere near the quality of the originals. Strega Nona, by Tomie de Paola — De Paola has written many wonderful books (I love The Knight and the Dragon!) but this twist on a famous folk tale is the best known. Music. Sing to your child. Sing a lot! Sing those little songs that have been passed down and polished smooth through the years; those folksongs are ideal for teaching your child about the joy of music, of rhythm, of words and melody. (Bonus: later on, they will turn out to be history lessons, too!) Simple rhythms, melodies, and harmonies sung in real life are ideal for small children; more complex recorded music is lovely, too, but folksongs teach the building blocks that go into the more complex material. Your child does not care that you do not have a beautiful singing voice or even that you cannot sing your way out of a paper bag. He just wants to hear you sing, because singing does not only communicate language and music; singing communicates love and joy. When you sing, your child feels happy, loved, and secure. Singing as you work around the house fosters a cheerful, loving atmosphere (and embarrassment when the kids get older — another bonus feature). I used a double CD collection called American Folk Songs for Children by Peggy and Mike Seeger, which was great, but there are lots out there. Remember Raffi? He’s back, and as good as ever! Here’s one collection, but you can find lots. Science and art. Preschoolers love to do activities and projects. They love to make art, and they love to find things out. There are lots of books of art and science projects for young children, but I didn’t want to buy a whole lot of them sight unseen and then find out that they weren’t very good, or that all the projects overlapped. I checked all the books out of the library instead (I requested some titles through InterLibrary Loan). I picked out all the projects that looked good to me, and assembled them into two binders: one for art, divided into categories by media, and one for science, divided into subjects like the body, colors, nature, and so on. I used those binders for years! Whenever I needed to plan a little activity, I would get out those binders and pick something to do. The art books I used are out of print now, but all you have to do is browse the 745 section of the children’s room at your local library. There are plenty of good books. Playgroups or co-ops. I did not have a lot of success sending my kids to a preschool program (we did participate in a large co-op for a while, but it got too demanding), but I did participate in small co-operative preschool/play groups. These were organized with friends, usually involved 4-5 children, and met twice a week in our homes. We enjoyed those groups very much, so next time I’ll talk about how to organize a small preschool group. I really love this post! Your advice is right on target, and so easy to follow.